My Premonition Came True: It is a Royals – Mets World Series! In August I had a premonition. I was visiting my sister in New Jersey. My sister is a rabid Mets fan. In fact, she and her children and some friends have held Mets season tickets for over 20 years. I, on the other hand, although I love the Mets and also grew up in New Jersey, am now a citizen of the Kansas City metro area, and so am a Royals fan. Although I do not have season tickets, I do go at least once a year and watch games on television. Baseball is actually my favorite team sport. Although people sometimes get hurt, usually it is unintentional …not counting that one nasty play that hurt the Mets player. I like sitting and watching and cheering and eating peanuts and popcorn and fries and frozen lemonade. We have a friend who has traveled to almost all the ballparks in the USA. He has stayed with us twice to go to Royals Stadium. First just to see it, then he came back to see our wonderful remodeled stadium. Going to the game with him is always fun. He is a human computer of baseball facts. But, I digress, back to the Worlds Series. My sister thought I was dreaming. But I felt secure in my vision. It would be a Royals/Mets World Series. Slowly my vison came true. Both the Mets and the Royals won their division titles. Step one accomplished. People were not beginning to believe me. There was a little drama in my life as the St. Louis Cardinals also won their division. My husband is from St. Louis. His family are ardent Cardinal fans. So while I was happy for them that they won the division, I knew they would not advance. My vision was set. The Mets and the Royals all the way. Then the Cubs were in mix. I feel for the Cubs and for their fans. For over 100 years, they have not won a title. We have many family and friends who are also from Chicago and love their losing Cubs. Although I love them, I knew the Cubs would not win. It would be Mets and Royals all the way! As for the Toronto Blue Jays. well I like Canada. My daughter’s fiancé is Canadian. And I like the color blue. I did notice from the beginning that all four teams that advanced had blue in their team colors. So I knew it would be a blue series. Blue, my favorite color! But I knew it could not be the Blue Jays. I was sure. I was so sure, I called my sister and said, “Send me a Mets shirt as soon as possible. I want to wear both shirts when I go to a World Series Game. Being the good sister that she is. She took my niece and purchased a Mets Division Winner t-shirt and sent it to me express mail. Now I am set. I have my Mets shirt. I have my Royals gear. For six games I will be rooting for both teams. I am pretty sure it will be a seven game series! And I will go to at least one game. I have friends with season tickets. And one of my best friends in the world has promised to take me to a game. She and her husband will not let me down. Game seven will be the difficult game. One of my t-shirts will have to come off. Mets? Royals? It is a difficult decision. But although the Mets have been a part of my life since I was a child, I made a commitment when I moved to Kansas. Go Royals! I have a sense of completion. A sense of a burden lifted from my shoulders. An empty container sits in my spare room. It held the pieces of an afghan that my Mom began knitting for my niece over seven years ago. 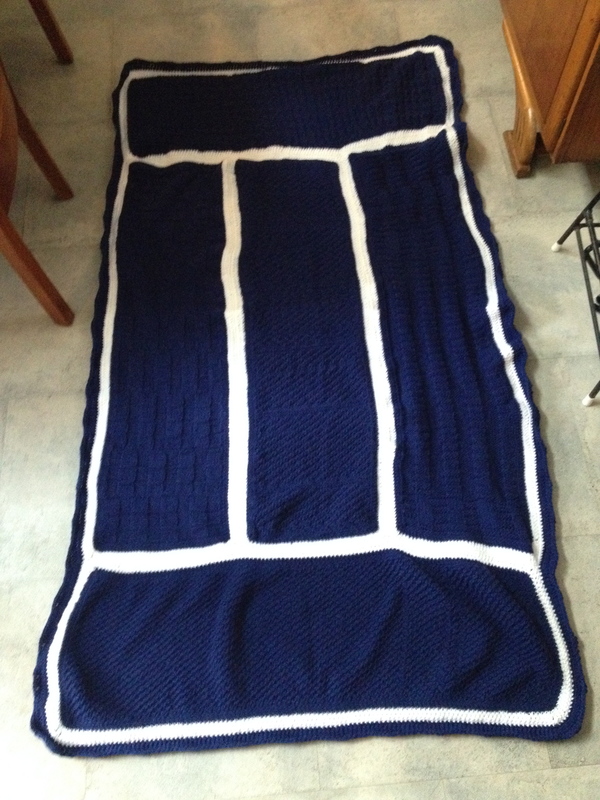 This blue and white afghan made in Penn State colors was supposed to be used at college. That never happened. But thanks to the Royals, I completed this afghan! Their drive to succeed and never give up gave me the inspiration to finish projects that my Mom had started years before she passed away. My Mom started two afghans at the same time; a blue one for my niece and a green one for my son. She knitted large panels, completing five for both my niece’s and my son’s afghans.. She even started crocheting borders around the panels of blue that would one day become my niece’s afghan and green for my son’s. But my Mom never finished either project. My Mom working on the afghan for my son. She could make the panels, but she never put them together. I have my opinions as to why she could not finish. Partly I think because she had the pieces in two separate homes. Some she worked on in their apartment in New Jersey. Other pieces were completed at their home in the Catskills. Any discussions of the afghans became a ‘tease.’ “Grandma, are you ever going to get them done?” She would nod her head and say she was working on them. But she did not finish them. My Mom died suddenly. The afghans were left undone. But we were not thinking about them. We were trying to deal with life without a wonderful Mom and Grandma. Nine months after my Mom died, my Dad died. There were even more unexpected sorrows. My siblings and I left our parent’s homes untouched. The apartment and the house stood empty. We could not deal with the memories that awaited us. The afghans waited, forgotten. In May of 2013, we began to clean my parent’s apartment. It had been almost two years since my Dad passed away. While we cleaned, I found a container with some pieces of the afghans and some yarn, but not enough to finish the project. Since I am the only child who knits and crochets, I decided to send the pieces to my home in Kansas. Perhaps I could do something with them. But I knew she had completed more pieces. I just was not sure where they were. In July of 2013 my brother and I went up to the home in the Catskills. I found the rest of the completed sections of the two afghans along with extra yarn, her crochet hooks and knitting needles, and the instructions she was using to make the afghans. My brother shipped these to my home as well. I left the boxes in my spare room for a year, packed and untouched. I could not bring myself to open the boxes. I knew what was in them. I knew I needed to do something with them. But I just did not know if I could actually complete them. But this summer, I finally tackled the boxes. A neighbor, a young woman I have known since she was in preschool, was raising money for the Lymphoma and Leukemia Society by helping people organized. Although I am usually organized, I needed help for this project. For my donation to the charity, I received five hours of help. We went through all the boxes. We unpacked all the yarn, thread and instructions. We placed the pieces of the two separate afghans into two separate containers. 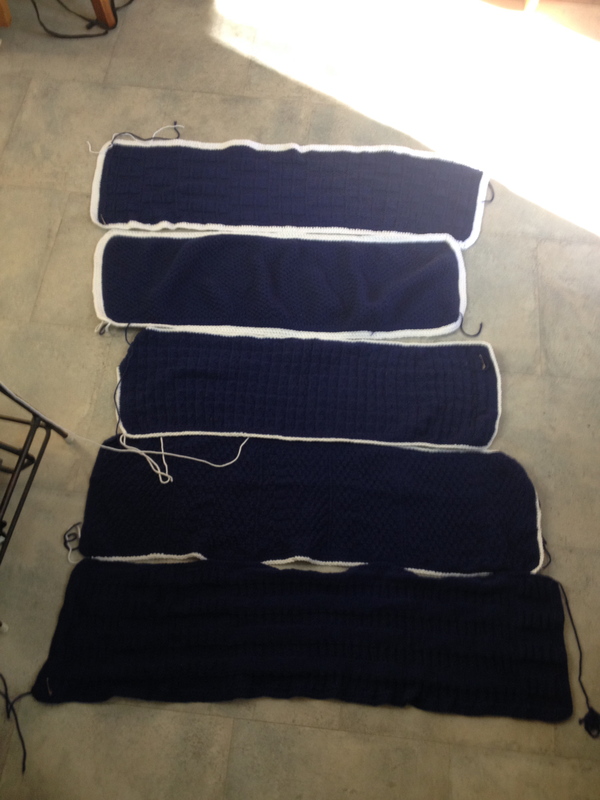 I could see what needed to be done to complete the afghans. But I still was not quite ready to work on them. I was not quite ready to pick up the pieces that my Mom had started so long ago. I was not ready to touch the afghans she had worked on so lovingly. My son and my niece both celebrated birthdays this month. Both are October babies. And with the Royals in the Pennant Race, I began to think more and more about the afghans. I felt that she wanted me to finished them this year. I could not give up on this project, just as the Royals would not give up on their October quest! Game four of the World Series, Royals versus Giants. Since we live in the Kansas City metropolitan area, this is a very big event. My husband was out of town. I was home alone, watching the game by myself. And I decided it was time. I could work on an afghan as I watched. My niece’s afghan, what my Mom had completed. I brought now the tub that had my niece’s afghan. I put the pieces on the floor. I could see that my Mom had completed white borders around two of the panels, and started the borders around two others. I set myself the goal of completing the borders while I watched the game. COMPLETED! I then examined the pieces. My Mom had made each panel a slightly different size. I think this might be why she did not put them together. She did not know what to do. I did not want to change these panels. I had three long ones (one very long) and two short ones. So I made a design using the shorter panels to go above and below the longer panels. I began to sew them together, gathering as needed. I put the longest panel to the outside. And I finished that during Game 5! Then I began a border around the entire afghan. First I did a row of single crochet in white; then a row of double crochet in white. I knew my Mom would never leave a white border. So I added a single crochet of blue, and then a double crochet row of blue. It still did not look right. I then added a scallop. Perfect. My niece’s afghan completed during game 6. I finished it the day before my niece’s birthday, during Game 6. Yes even during all that excitement, I was able to crochet. I mailed it to her on her birthday, in the afternoon before Game 7. I thought finishing the projects my Mom started would be too painful to accomplish. But I was wrong. I felt a burden lift from my shoulders as I began to crochet. I think my Mom would be happy to know what I was doing! The pieces my Mom finished of my sons afghna. Before Game 7 of the World’s Series, I brought the container that held my son’s afghan into my family room. I took out the five pieces and decided what I needed to do. This border was different than the one my Mom had put around my niece’s afghan. I began to crochet. Sometimes my mind wandered to my Mom. I thought about her knitting and crocheting these panels. My stitches have a slightly different tension than hers. But it does not matter. 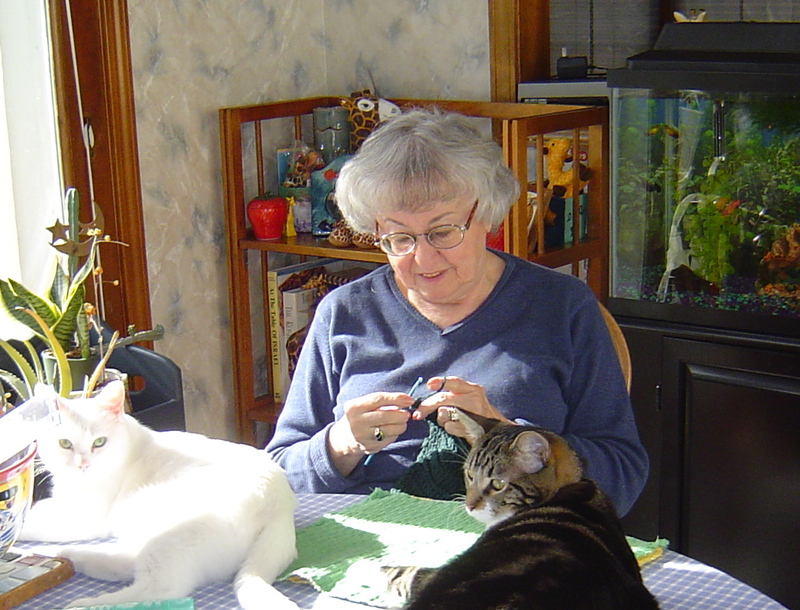 When I crochet, I feel close to my Mom. The Royals lost the game, but they showed so much vitality and good sportsmanship. Even when our catcher was hit hard in the leg with a pitch, he battled through the pain. I felt for him! Finishing my Mom’s projects during the World’s Series seemed like the perfect project to accomplish. 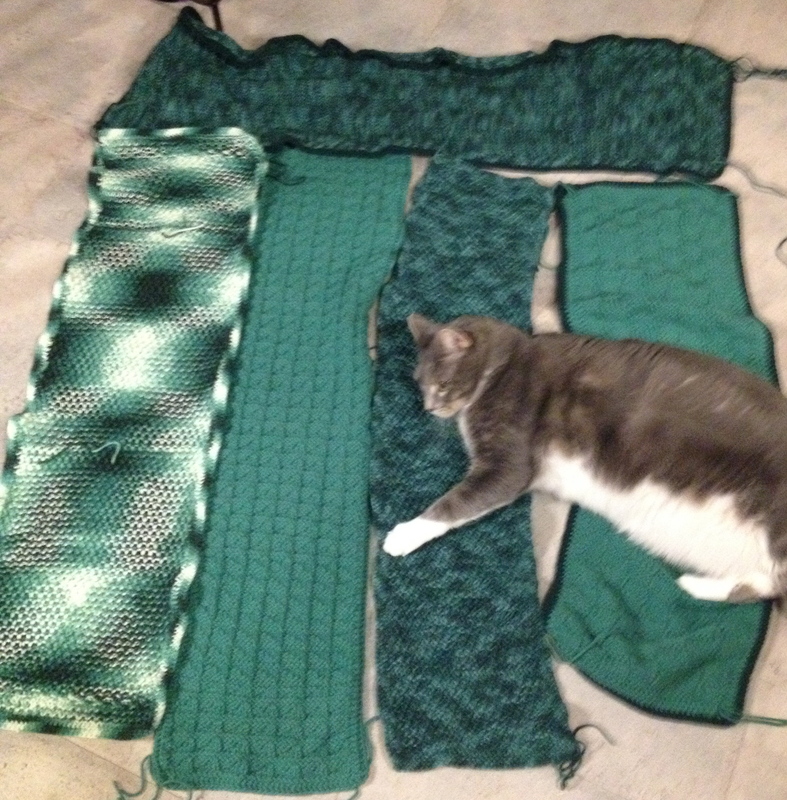 Soon my son’s afghan will be completed as well. Thank you to the Royals for a great October and for giving me the inspiration to succeed in a project as well.